Welcome to the April 2019 issue of The Transportist, especially to our new readers. As always you can follow along at the transportist.org or on Twitter. 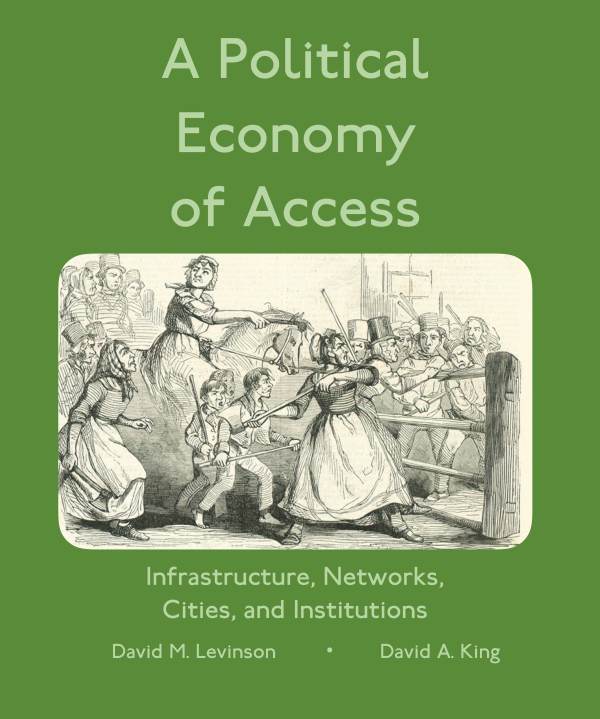 Now available: A Political Economy of Access: Infrastructure, Networks, Cities, and Institutions by David M. Levinson and David A. King, in paper and PDF. Why should you read another book about transport and land use? This book differs in that we won’t focus on empirical arguments – we present political arguments. We argue the political aspects of transport policy shouldn’t be assumed away or treated as a nuisance. Political choices are the core reasons our cities look and function the way they do. There is no original sin that we can undo that will lead to utopian visions of urban life. The book begins by introducing and expanding on the idea of Accessibility. Then we proceed through several major parts: Infrastructure Preservation, Network Expansion, Cities, and Institutions. Infrastructure preservation concerns the relatively short-run issues of how to maintain and operate the existing surface transport system (roads and transit). Network expansion in contrast is a long-run problem, how to enlarge the network, or rather, why enlarging the network is now so difficult. Cities examines how we organize, regulate, and expand our cities to address the failures of transport policy, and falls into the time-frame of the very long-run, as property rights and land uses are often stickier than the concrete of the network is durable. In the part on Institutions we consider things that might at first blush appear to be short-run and malleable, are in fact very long-run. Institutions seem to outlast the infrastructure they manage. Many of the transport and land use problems we want to solve already have technical solutions. What these problems don’t have, and what we hope to contribute, are political solutions. We expect the audience for this book to be practitioners, planners, engineers, advocates, urbanists, students of transport, and fellow academics. As Parking Needs Shrink, How Will That Impact The Future Of Housing Design?